HONG KONG (AP) — Hong Kong journalist groups have expressed dismay over the government’s refusal to renew a work visa for a Financial Times editor. 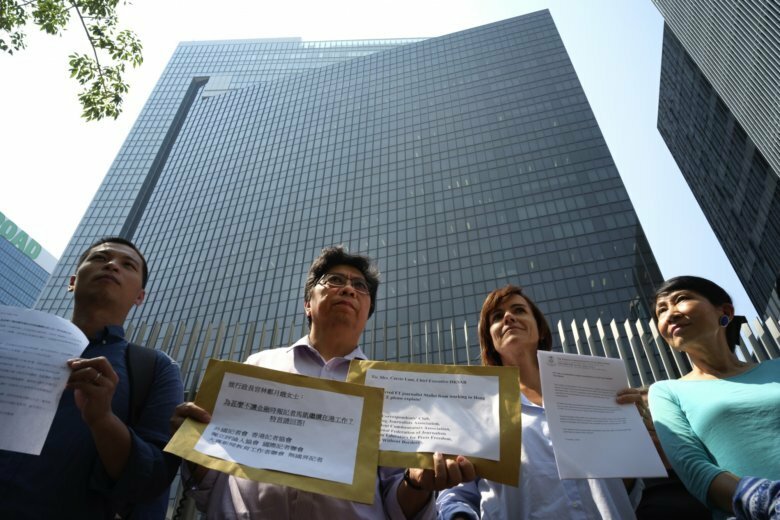 Representatives from the Hong Kong Foreign Correspondents’ Club, Hong Kong Journalists Association and other journalism advocacy groups gathered at the Central Government Offices on Monday and handed a letter of protest to a Hong Kong Government representative. “We are shocked and deeply concerned over the decision by the Hong Kong authorities to refuse a work visa renewal for Victor Mallet, Asia News Editor for the Financial Times,” said Chris Yeung of the Hong Kong Journalists Association. China has defended its decision to deny a new work visa for Mallet, who is vice president of the Foreign Correspondent’s Club. Authorities have criticized the club for hosting a talk in August by the leader of a now-banned pro-Hong Kong independence party. Rights groups have called the visa rejection the latest sign of Beijing’s expanding restrictions on the territory, including legal cases brought against pro-democracy legislators and organizers of large-scale anti-government protests in 2014. The London-based Financial Times said in a statement that it was given no reason why Mallet’s application was rejected. Other groups that protested the decision included the Hong Kong Independent Commentators Association, International Federation of Journalist, Hong Kong Journalism Educators for Press Freedom and Reporters Without Borders.